I’ve been looking for a fun way to make black eyed peas for a while now and I finally found it! Last week I tried out Black-Eyed Peas in a Spicy Goan Curry from Ruta Kahate’s 50 Spices, 50 Dishes and I really enjoyed it. This is what I do, I get some idea for an ingredient, pick up the ingredient, and go searching. 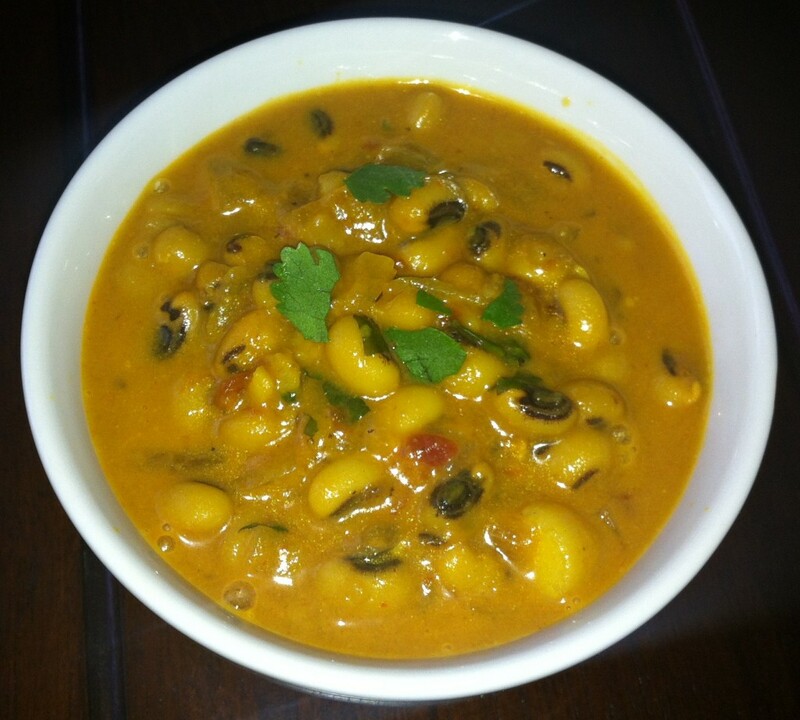 This Goan style black-eyed pea dish is really simple, but the coconut milk gives it a little something. I used more tomatoes because I wanted it tomatoey. Add the black-eyed peas, ~one tablespoon of oil, and ~4 cups water to the pressure cooker. I read that the oil will keep the beans from frothing out the top. Sometime I’ll write about my trials with the pressure cooker. I think it just takes practice to get the hang of it. You can also soak the peas for 6-8 hours, and just cook for 10 more minutes before adding the coconut milk. I happen to never know what we’re going to be in the mood for, hence no soaking. Cook for 8 minutes past the whistle, put the pressure cooker under cold running water until all the steam comes out, open and drain out the peas. Meanwhile heat the rest of the oil in a medium saucepan. Add the onion and saute until it starts to get translucent. Add the garlic and ginger and cook until they are soft. Add the spices and cook for a minute. Add the tomato, sugar, and salt, and cook for a minute. Add the water and black eyed peas and cook for a about 10 minutes. Add the coconut milk and cook for another 5-10 minutes. Add the lemon juice and cilantro, stir and serve.